Learn how to setup the FONA MiniGSM to POST and GET to/from Ubidots. 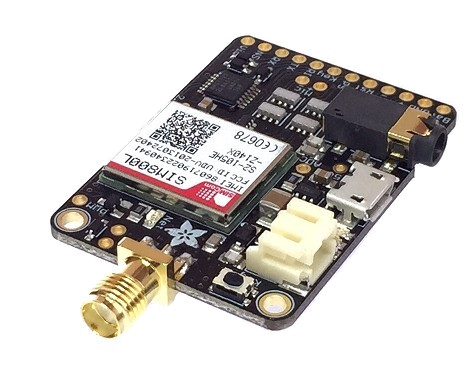 Adafruit FONA MiniGSM is an all-in-one cellular module that lets you add voice, text, SMS and data to your projects. In this tutorial, Ubidots will demonstrate how to send (POST) a simple value to the Ubidots API and how to receive (GET) the last value of one variable of your Ubidots account, using an Adafruit FONA device. 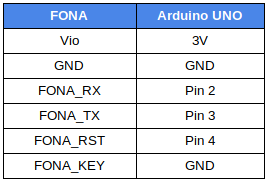 Following the table below, assemble the wired connections between the Arduino UNO and the FONA module. 1. Check if your device can connect to the internet. To this, download Adafruit_FONA library and run FONAtest example. Verify your code within the Arduino IDE. To do this, in the top left corner of our Arduino IDE you will see the "Check Mark" icon press it to verify your code. Upload the code into your Arduino UNO + FONA module. To do this, choose the "right-arrow" icon beside the "check mark" icon. To verify the connectivity of the device, open the serial monitor by selecting the "magnifying glass" icon in the top right corner of the Arduino IDE to see the connectivity logs. IMPORTANT NOTE: Before running the FONAtest example, make sure you have an active data plan. You will also need your mobile operator’s APN settings (APN, USERNAME, PASSWORD). You should be able to easily find these settings in Google or on your operator’s website. 2. Download the Ubidots FONA library and install it. For a detailed explanation of how to install libraries using the Arduino IDE, refer to this guide. With the following sample code you will be able to post the ANALOG readings taken from Arduino UNO analog port. 1. To post your first value in Ubidots, open the Arduino IDE and paste the sample code below. Once you have pasted the code, you will need to assign your unique Ubidots TOKEN and the APN (Access Point Name) of your cellular provider with username and password. #define USER "xxxxxxxxxx"  // if your apn doesnt have username just leave it ""
#define PASS "xxxxxxxxxx"  // if your apn doesnt have password just leave it ""
2. Verify your code within the Arduino IDE. To do this, in the top left corner of our Arduino IDE you will see the "Check Mark" icon press it to verify your code. 3. Upload the code into your Arduino UNO + FONA module. To do this, choose the "right-arrow" icon beside the "check mark" icon. NOTE: If no response is seen, try unplugging your Arduino and then plugging it again. Make sure the baud rate of the Serial monitor is set to the same one specified in the code (115200). Troubleshooting & FAQs: If the message received in the serial monitor is “PDP DEACT - error” Your service provider may be blocking some ports. You should call your service provider or try with another SIM card with an active data plan. 5. Confirm your data in Ubidots. Now you should see the posted data in your Ubidots account, located the device called "fona". With the following sample code you will be able to get a value from Ubidots to start controlling any asset you desire. APN (Access Point Name) of your cellular provider with username and password. 2. Verify & Upload the code into the board following the same steps provided in the POST step above. Troubleshooting & FAQs: If the message received in the serial monitor is “PDP DEACT - error” Your service provider may be blocking some ports. You should call your service provider or try with another SIM card with a data plan. 4. At this point, you should be able to see the last value received in Ubidots of the variable specified in the firmware. With this simple tutorial we are able to POST & GET data to/from Ubidots with the ease of the Arduino IDE and a Arduino UNO + FONA Module. If your wish to find more examples to handle context or timestamp values in your request checkout Ubidots documentation with the FONA by clicking here.